We had dinner first. Andy’s fillet mignon was a huge hit. The giant raspberry-chocolate truffle brownie I baked for dessert was half a hit. Chronically Late Cousin and Engineer Cousin had grown up mostly in Hong Kong, an ocean away from the American over-abundance of fat and sugar. Their idea of a rich dessert is mango pudding. The Cousins managed one polite bite each. Their husbands, Bubba and Quite White, ate their brownies, their wives’ brownies, and demanded more. I made sure Bubba took a plastic bag of brownies home. Surprisingly, Yee-Mah asked for her own bag. She told me I should open a bakery. I love Yee-Mah. We decided to play a team game. The winners would get first crack at the booze brought by Cousin Freddy. The losers would be stuck with kitchen clean up. If you don’t think those are high stakes, think again. After Andy gets through with a kitchen, the counters and stove have morphed into a dirty layer cake of discarded vegetable peelings, bits of fat, bits of cheese, and piles of spices and flour. This creation is iced with carbonized grease and decorated with a hundred dirty bowls that once housed ingredients. Less than one-third of the plates and bowls will fit in the dishwasher. It takes an hour to clean the stove alone. The game of choice was Taboo. A player from each team is given a stack of cards. The cards have a goal word at the top, and a list of “taboo” words below it. 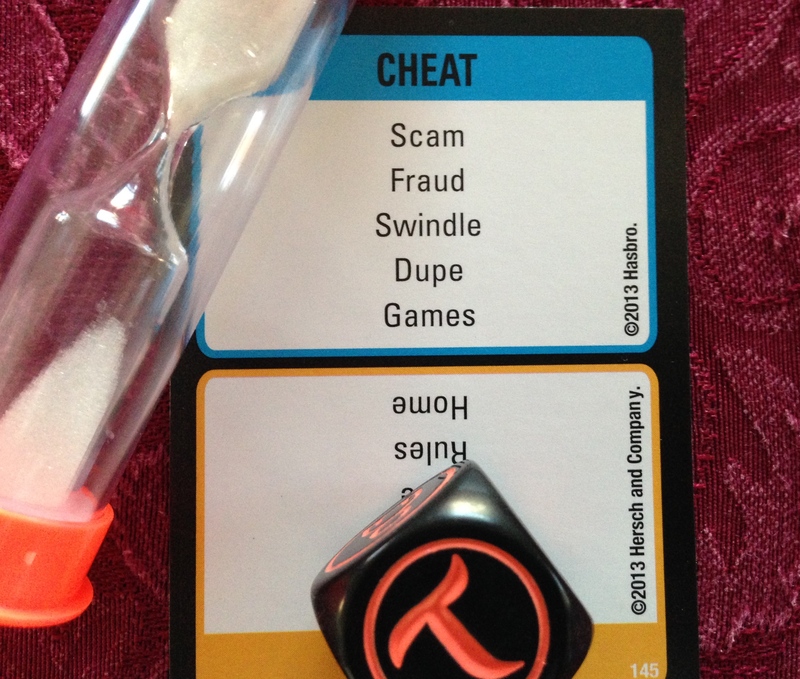 The player tries to get their team to guess the word at the top of the card without using any of the forbidden/ taboo words written below the goal word. 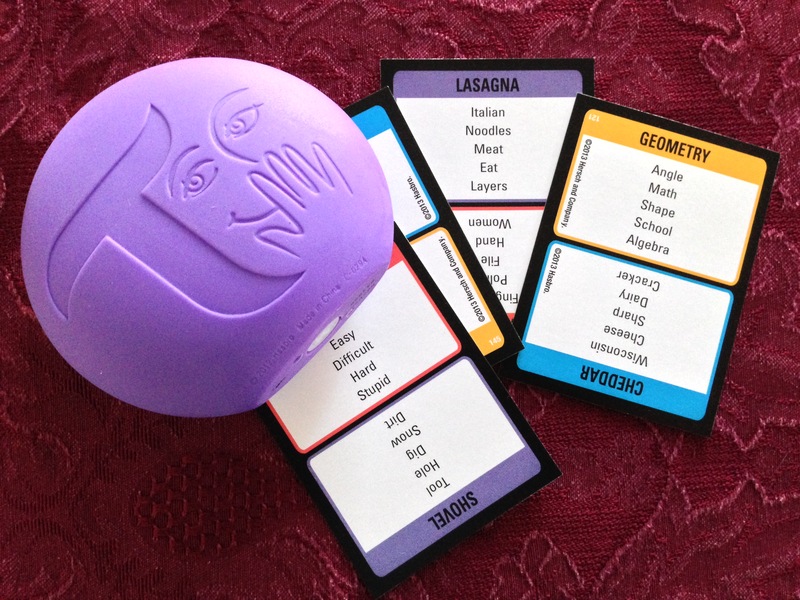 If you want your team to guess the word “lasagna,” you can’t give them hints with taboo words such as “Italian” or “noodles.” If your team guesses the goal word before time runs out, your team gets a point. If you screw up and use a “taboo” word, your team loses a point. Players have to either be creative or draw on a shared pool of knowledge. Someone – probably Engineering Cousin – decided we should split up the couples. It seemed fair. We white folk shrugged and agreed. Team Asian-American crushed us. Repeatedly. I thought they might cheat with Cantonese. Instead they cheated with math. They used formulas to get answers such as “different” from differentials. (Don’t ask this liberal arts major what these formulas were.) Even Quite White, an engineer like his wife, could barely follow their math or their logic. I love Taboo. PSCS hates it, but will play it with me. I also love the flabbergasted look people get when you pull off a clue that only makes sense to you. That was Team Caucasian. We were nothing but flabbergasted. Repeatedly. So sad. It was such a slaughter, it wouldn’t seem like Team Asian would have enjoyed it as much as they did. Although, I think they enjoyed it less the following morning. So hung over. I wouldn’t let Andy cook for a group again! Or else get some Asians on your team. Kate — All subsequent games were integrated. Such a slaughter was never seen again…until the women beat the men. Andy is always the one cooking. His dishes are fantastic. I’ve gotten really, really good at cleaning. Mad scrubbing, mopping, and vacuuming skills, that’s me. Hey! What’s with the cheat card? It was an awesome clue! Just a random card, honey. I swear. Not remotely symbolic. I haven’t played Taboo for a long time. My sister and I make a good team. My teenage grandchildren are the math geniuses, and they’re only 25% Chinese. They are 50% Jewish, though. I think sisters make the most formidable teams. So much shared history. Probably a boyfriend in the sisterly lexicon for every adjective. I can’t play Taboo with my spouse … anymore. Bad memories of game gone bad in another country … I need to stop typing … getting all sorts of fired up just thinking about it. Apoteke. It is a pretty fun game! But where in the world is Cosette? I keep guessing!